I'm 77 and trying to learn these things by myself. You make it so easy .."
Just add names and instantly create your family tree. Or just import a GEDCOM file. Your website will contain Ancestor, Family and Descendant charts that are created from the information you enter online or upload from your computer. Each chart contains several generations and their pictures. Separate passwords for administrator and visitors (optional). For privacy you can hide some or all the information of Living Persons in your family tree. A calandar of all upcoming Birthdays and Wedding Anniversaries of family members. View by month or for the entire year. 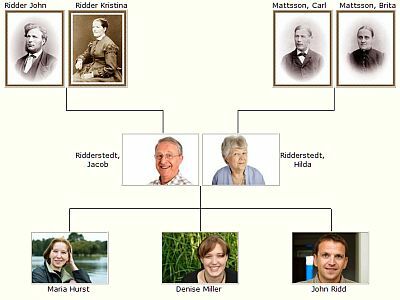 Find out how your are related to any name in your Family Tree. The Tool calculates relationships between any two names and displays a graphical chart. Upload and share pictures or have your family email them directly to your website. Associate one or more names to pictures and they will appear alongside the name in your genealogy charts. See ancestors and descendants as a tree of pictures. Family Tree Maps show the birth and death locations of the members in the charts of your family tree. The locations are automatically computed and plotted on the map. Your website will automatically generate slide shows for each of your photo albums. TribalPages.com began in 1999 and proudly hosts over 350,000 Family Tree websites.